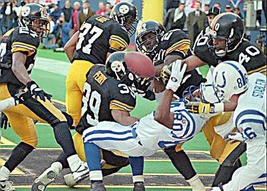 It Wasn’t Meant To Be Like This – 1996, The (NFL) Year Of The Cat! ​The relative immediate success of the Carolina Panthers and the Jacksonville Jaguars was unprecedented in NFL history. Far from losing their first twenty-six games as the Tampa Bay Buccaneers had done over their first two seasons two decades earlier, the Panthers and Jaguars won seven and five games respectively and would end their second seasons with appearances in their respective championship games. Running back, Natrone Means was a force on the ground the Jacksonville Jaguars in 1996. While NFL owners had looked at ways of making the two new teams more “competitively ready”, it wasn’t the aim to have their success be as immediate. Whether it was a desirable result or not depends on who you speak with, but it appears to be a “one-off” approach that wasn’t replicated with the 1999 Cleveland Browns or the 2002 Houston Texans. What perhaps made their success even more remarkable is that not many in the NFL world expected the 1995 NFL season to even begin with teams in Carolina and Jacksonville. The origins of the 1995 expansion Carolina Panthers and Jacksonville Jaguars arguably goes back to the summer of 1987, after a particularly turbulent year in the football world. The 1986 NFL campaign began with the long-anticipated court case with the rival football league, the USFL, as well as the much-publicized problems with NFL players and drugs, including the death of Cleveland Browns’ cornerback, Don Rogers from a cocaine overdose. By the time the New York Giants had pounded the Denver Broncos in Super Bowl XXI in Pasadena, California, however, the outlook for the National Football League suddenly appeared altogether healthier. With the USFL safely out of the way and many of their biggest stars signed with NFL teams, as well as the NFL having taken steps to tackle its “drug problem” (at least publicly), the idea was floated around wealthy investors that the NFL was looking to add two more teams to its ranks. Initial talks between NFL Commissioner, Pete Rozelle and the NFL owners included representatives from Phoenix, Jacksonville, Baltimore, Montreal, and Memphis. Then only two weeks into the 1987 campaign, the players walked out on the league in the second work stoppage in five years. The previous strike in 1982 had cost the league seven weeks of its season. This time, there would be no such stance from the NFL. Owners brought in strike players and the teams they played on were known as “scab teams”. Their results, however, would count towards the regular season records. The relationship between the players and the owners (essentially the NFL) was at an all-time low, and even though play resumed after four weeks (with three of those weeks contested with scab teams), for some teams the bad feeling lingered for some time. Following the end of the regular season, the St. Louis Cardinals packed their bags and went through the gateway to the west and settled in Arizona. This would knock Phoenix out of the running for an expansion team but ultimately led to St. Louis immediately entering the race. As things progressed over the following years, the safe money appeared to be on Baltimore and St. Louis returning the NFL in time for the 1995 campaign. ​In 1993 the first official presentations were made in front of the NFL at the O’ Haye Hyatt Hotel in Chicago. By now, at least to those close to the process, the smart money had changed. Baltimore had a long history with the NFL until 1984 when the Colts bolted for Indianapolis. St. Louis likewise, until the Cardinals vacated the gateway to the west for the west. Furthermore, St. Louis had the NFL’s all-time leading rusher, Walter Payton as part of their presentation team. Perhaps there was some surprise then when Carolina was awarded the twenty-ninth franchise shortly after. They had proven there was an appetite for NFL football in both Carolina states, having hosted three pre-season games in 1990, ’91, and ’92. Two of the states’ banks had agreed to fully finance and build the stadium, and it was a market largely untapped by the NFL. The Carolina Panthers were born. You can read more about this here. By all accounts, one of the favorites, St. Louis, had a pitch laced with disaster and ultimately fell short of inspiring the NFL owners. In fact, St. Louis’ overall bidding team was falling apart behind the scenes. The NFL owners had made the decision to put off deciding on the second expansion team until November of that year. It was here that pendulum swung decisively towards the apparent underdogs in the whole affair, Jacksonville. Jacksonville was seen as a tiny market – even smaller than such NFL destinations as Buffalo or Green Bay. Add to that there was already two NFL teams in Florida, a state that wasn’t particularly large, to begin with, and it would appear there simply wasn’t the interest for another franchise. The Jacksonville bid had almost folded completely, however, in the months prior to the meeting in Chicago. With everything in place for refurbishments to the aging Gator Bowl, the Jacksonville City Council would vote down the $112 million agreement. This would have been a blow to the NFL had the Jacksonville bid folded. With St. Louis no longer serious contenders, and an apparent disinterest from the league in the Memphis bid (the insistence that their team would be named the “Hound Dogs” did little change this), as well as rumors that the Redskins’ Jack Kent Cooke (and his influence) was cold to the idea of a team in Baltimore encroaching on his market, the NFL secretly brokered talks between Jaguars’ potential owners, Mark Weaver and city officials. By September 1993, the deal was back on. You can read more about that here. 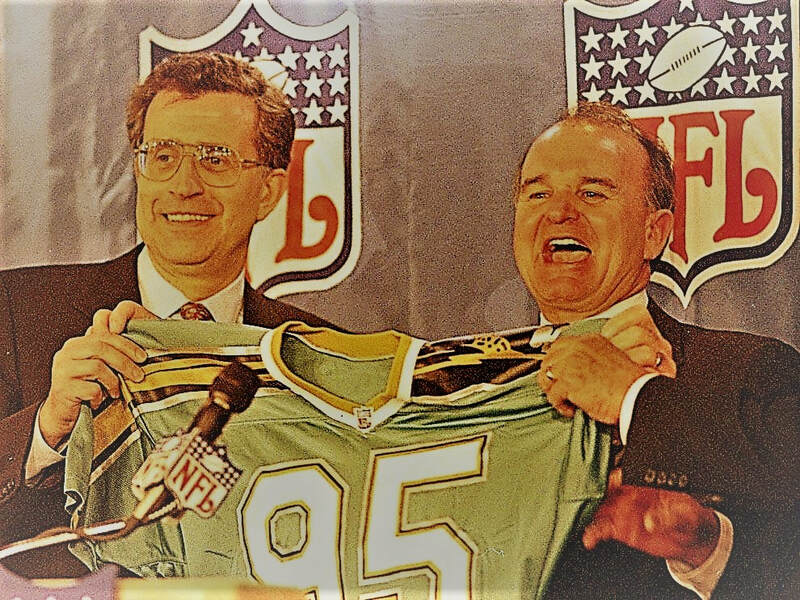 ​When the owners met in November 1993, Jacksonville was awarded the second expansion team by a vote of 26-2. The Chicago Tribune’s, Don Pierson described it as “one of the greatest come-from-behind victories in NFL history!” You can read more about that here. Two weeks following Super Bowl XXIX on 15th February 1995, the NFL held its Expansion Draft. All twenty-eight teams had to make six players available. These players were “unprotected”, meaning if the Panthers or Jaguars picked them, their current could not match the offer and they were essentially traded. When a team’s player was chosen, however, that team was able to remove one of its unprotected players from the list. The Panthers and Jaguars would also receive the number one and number two picks in each round respectively (although the Panthers traded their overall number one pick to Cincinnati). You can read about the Expansion Draft in more detail here. The Panthers, perhaps predictably due to their general manager, Bill Polian’s long history with the Bills, brought several prominent Buffalo players on to their inaugural squad. In fact, their overall approach was to bring in veteran players, particularly on defense with linebacker, Sam Mills perhaps being most notable. ​Although they had signed former Bills’ back-up, Frank Reich, they also used their first-round draft pick to select, Kerry Collins. Although Reich would start the season, it would be Collins’ team by the year’s end. The Carolina Panthers began the 1995 campaign, as expected, with decisively more losses than wins. Those victories, however, would come sooner than most expected. After losing their first five games (three of which were by a touchdown or less), they bagged four wins in a row. Only a narrow 20-17 loss at the Washington Redskins in the season finale stopped the Panthers from breaking even. They would end their initial season with a very respectable 7-9 record – the best record ever for a first-year NFL team - and were cautiously optimistic hopes for the following season. No-one, though, could have foreseen the way 1996 would unfold. The Jaguars, on the other hand, found life in Jacksonville a lot more difficult. Not that they had less talent, but they had opted for younger players as opposed to mainly established veterans. While the Panthers were seemingly building to win “now”, the Jaguars were building a team with longevity in mind. Michael Huyghue was put in charge football operations after serving as an assistant general manager at Detroit. He quickly realized, to many NFL players, going to Jacksonville was viewed as “being sent to purgatory”, and as such he would struggle to match Carolina for veteran players. Instead, they decided to opt for youth, and along with head coach, Tom Coughlin, the pair had a very clear idea in mind of how they wanted to build the team. They would use their first-round draft choice of left tackle, Tony Boselli looking to establish a strong offensive line. They signed Steve Beuerlein to be their starting signal caller but also inked a little-known back-up quarterback from Green Bay, Mark Brunnel. ​They didn’t, however, struggle for fan support, something which many believed would go against the Florida franchise. Teal Power was strong from the start in Jacksonville. 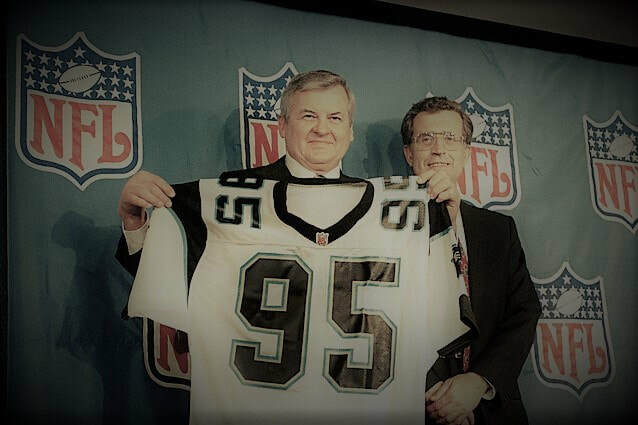 In fact, the apparent rabid fanbase awaiting an NFL team was one of the reasons for the decision to award the franchise, at least according to (then) NFL Commissioner, Paul Tagliabue, who said there was an obvious hunger for NFL football in Jacksonville. By season’s end, the Jaguars had managed to scratch out five wins, but they were far from convincing. And while it was only two wins shy of Carolina’s final tally, they were far from the impressive, slick showing of the expansion cousin Panthers. 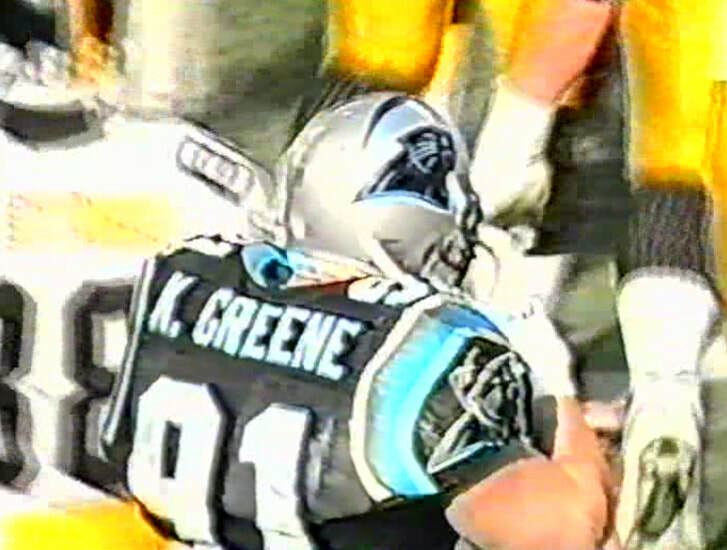 The Panthers would begin the 1996 season with three straight divisional games against the Atlanta Falcons, the New Orleans Saints, and the San Francisco 49ers. They would win all three to start the season 3-0 and on top of the NFC West. In the fifth week of the year, the undefeated Panthers would travel to Municipal Stadium in Jacksonville to face off against the Jaguars. Although they had met in the previous pre-season, this was their first regular season meeting. As if to add a little extra angle to the affair, the Panthers starting quarterback was Steve Buerlien (? ), who was starting place of the injured Kerry Collins, and who had suited up for the Jaguars in 1995. In a minor upset, the Jaguars would defeat Carolina 24-14. It was a much-needed win for the North Florida team. Jacksonville had started the 1996 season in a similar fashion to their first campaign as they limped to a 3-6 record. Following a surprise 24-9 win over the Pittsburgh Steelers on opening day they had lost three straight games before their surprise win at home to Carolina. Three more defeats in their next four games did nothing to suggest anything out of the ordinary would happen for the Jaguars as they entered into their bye-week. However, after winning five of their next six games they found themselves with an 8-7 record, and more importantly just one more win away from a playoff berth. All they had to do was see off the lowly Atlanta Falcons who had won only three games all year. ​All looked well for the Jaguars as they led 16-3 midway through the third period, and then 19-10 in the fourth. The Falcons though drew to within two points, 19-17, and then got the ball back and drove it to the Jaguars 13-yard line where Morten Andersen came on to attempt an almost certain 30-yard field goal in the games dying seconds. As the normally sure-footed Andersen made contact with the ball, however, he appeared to slip on the turf and the pigskin went off to the left. The field goal was no good. The Jaguars had won the game and were going to the playoffs with a 9-7 record. The Jaguars made the playoffs following a Falcons' missed field goal in the last game of the '96 regular season. Carolina, on the other hand, would lose three of their next five games, and following a frustrating 20-17 loss at the Atlanta Falcons in week ten, their record stood at 5-4. They would then go on one of the most impressive streaks of the year, winning their next six games, including an impressive victory over the San Francisco 49ers, 30-24 at 3Com Park. Now, entering the final week of the season, Carolina welcomed the defending AFC Champion Pittsburgh Steelers to Ericsson Stadium – the team head coach, Dom Capers had served as defensive coordinator for in the three years prior to joining the Panthers. A win would see them crowned champions of the NFC West. As he warmed up on the field, Carolina quarterback, Kerry Collins quipped, “Something special is going on here!” It certainly was. ​The contest was a tight, defensive struggle which saw the Panthers go ahead 7-0 on their first drive off the game. A safety soon followed stretching the lead to 9-0. They would ultimately come out on top, 18-14. The win was their seventh straight, and it also gave the Panthers their first ever division crown and an impressive 12-4 record. It would also give them a week off before their first ever playoff game, at home to boot. There would be no such luxury for the Jaguars. Following their last-second win over the Atlanta Falcons, they would pack their winter clothes and head to the winter climate of upper state New York to face the Buffalo Bills, only three years removed from four consecutive Super Bowl appearances, in the AFC Wild Card game. The Bills had never lost a playoff game at Rich Stadium. That was about to change. Buffalo took the lead early on, but the resilient Jaguars proved they were worthy of their post-season place. Running back Natron Means had an amazing day on the ground for the Jaguars as he notched up 175 yards on 31 carries and a touchdown. However, with the score tied at 27-27 late in the game, the Jaguars defense sacked Bills’ quarterback Jim Kelly, knocking the ball loose as well as Kelly from the game. The Jaguars recovered and almost unbelievably embarked upon a 31-yard drive to set up kicker Mike Hollis for a 45-yard field goal to give them the win 30-27. The upstart Jaguars advanced to face the Denver Broncos at Mile High Stadium. The Broncos were the AFC’s number one seeded team with a 13-3 regular season record. The game would go on to be arguably the biggest playoff upset of the nineties. The Broncos took a 12-0 lead in the first quarter and looked completely comfortable. Then, amazingly and out of nowhere the Jaguars scored twenty-three unanswered points to take a commanding 23-12 lead. ​The Broncos pulled the score to 23-20 with just over seven minutes to play in the game, but some fine scrambling by Jaguars quarterback Mark Brunnel, one for a gain of 29 yards, took Jacksonville into scoring position again. With a little over three minutes remaining in the contest, Brunnel hit wide receiver Jimmy Smith from 16 yards out to make the score 30-20. Denver did manage to find the end-zone again, but it was too little, too late. Jacksonville had won again 30-27, and were going to the AFC Championship game. While the Jaguars had perhaps pulled off the upset of the nineties at Mile High Stadium, and after having defeated the AFC representative in the Super Bowl two weeks previously, the Carolina Panthers prepared to welcome the defending Super Bowl champion Dallas Cowboys. In front of over 70,000 people the second-year team took control from the start. An interception by veteran linebacker, Sam Mills would seal a 26-17 victory. Their victory would earn them a trip north to the sacred Frozen Tundra of Green Bay. 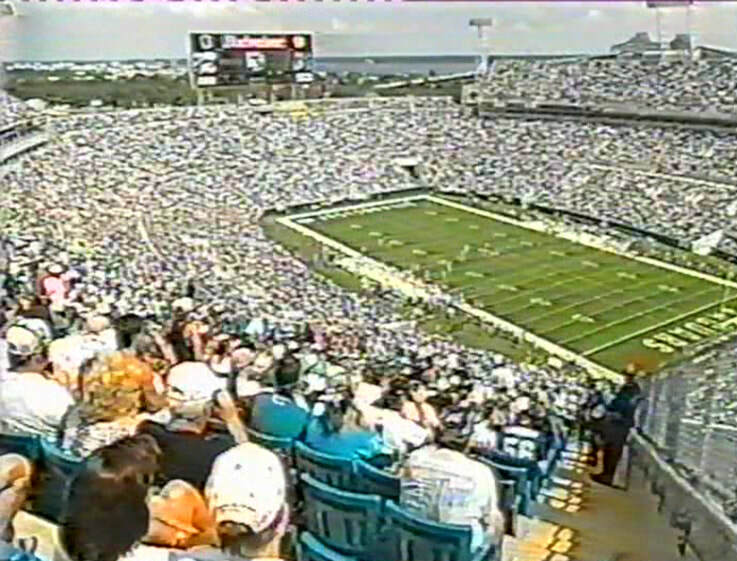 Initially, the outlook was favorable as Sam Mills again scooped an interception which set up an early Panthers score. ​However, as the game wore on, the Panthers wore down. The Green Bay Packers would come out on top, 30-13, and while each of the Panthers were understandably disappointed, they had surely come further than even they would have expected when training camp began several months earlier. Linebacker Lamar Lathon talks tough with Packers' QB, Brett Favre. 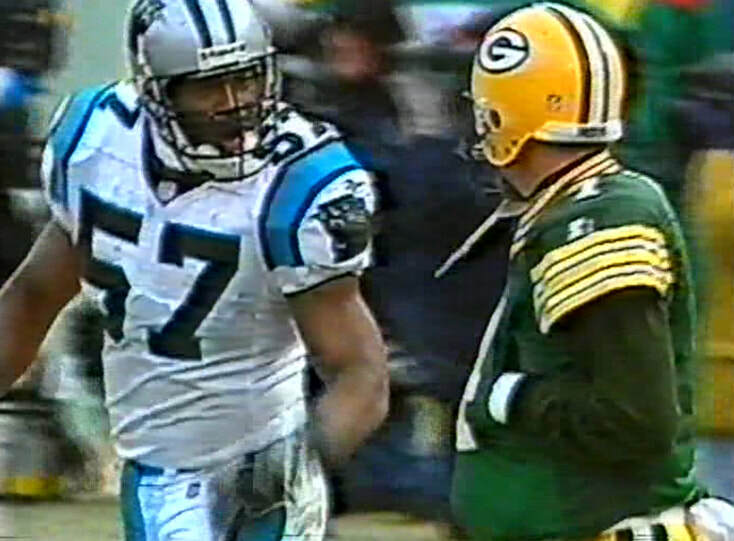 By the end of the 1996 NFC Championship game, however, Green Bay would be on top. The Jaguars were also traveling north, this time to the frozen confines of Foxboro Stadium to do battle with the New England Patriots for the right to represent the AFC in Super Bowl XXXI. The Patriots scored early taking advantage of a botched punt on the Jaguars first drive of the game, as Curtis Martin rumbled in for a 4-yard touchdown run two plays later. From then on the Patriots kept the game in their control. However despite taking a 13-6 lead deep into the fourth quarter with them, New England twice breathed huge sighs of relief as they Jaguars came close to levelling the game. With under five minutes left, the Jaguars were at the Patriots 5-yard line and were looking certain to score before Willie Clay stepped in fron of a Mark Brunnell pass for the interception. The Jaguars though forced the Patriots to punt, and Jacksonville began to drive once again. However linebacker Chris Slade forced the Jaguars’ running back James Stewart to fumble and Otis Smith scooped up the loose ball and returned it 47 yards for the score that sealed the game. The Patriots had won 20-6 and were going to Super Bowl XXXI. Although the Panthers would reach Super Bowl XXXVIII following the 2003 campaign, it was a completely different team than the 1996 incarnation and was guided there by John Fox. The remaining years of the nineties were unimpressive by comparison to the 1996 team, and they didn’t reach the playoffs again until their Super Bowl year. ​The Jaguars, however, continued to improve over the 1997 and 1998 campaigns, and by 1999 posted a 14-2 record, again reaching the AFC Championship game, where they lost to the Tennessee Titans, 33-14. Following that defeat, however, the Jaguars to would suffer the expected decline as their window of opportunity closed. 1996 though, for the Panthers and the Jaguars, despite coming up short, was a magical year in each franchise’s history. Check out the video below. It looks at the unlikely story of the Jacksonville Jaguars. In Captain Comeback Harbaugh, The Cardiac Colts And The Lost Miracle Of The 1995 AFC Championship Game we look at the 1995 Indianapolis Colts - a team led by Jim Harbaugh who developed a habit of bringing his team from behind and almost took them to the Super Bowl, coming up one caught hail-mary shy in the AFC Championship game. 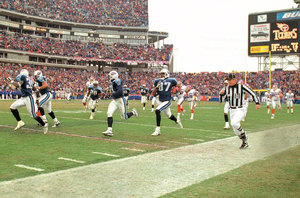 In The Music City Miracle And The 1999 Tennessee Titans - A Team Three Years In The Making Who Fell One Yard Shy we look at the 1999 Tennessee Titans - a team who had "roamed" the NFL in 1997 and 1998 only to make it all the way to the Super Bowl in 1999, winning one of the most controversial playoff games in recent history along the way.